Most of the surveying that we perform is done with the use of GPS (Global Positioning System) surveying equipment. GPS uses signals from the network of satellites orbiting the earth to calculate its position. GPS provides incredible accuracies and allows surveys to be done more efficiently and economically. We use the Trimble© line of GPS equipment for our surveys. Trimble© is the industry leader in GPS technology for surveying and many other applications. If you need a boundary survey, then you need to talk with Land Solutions. 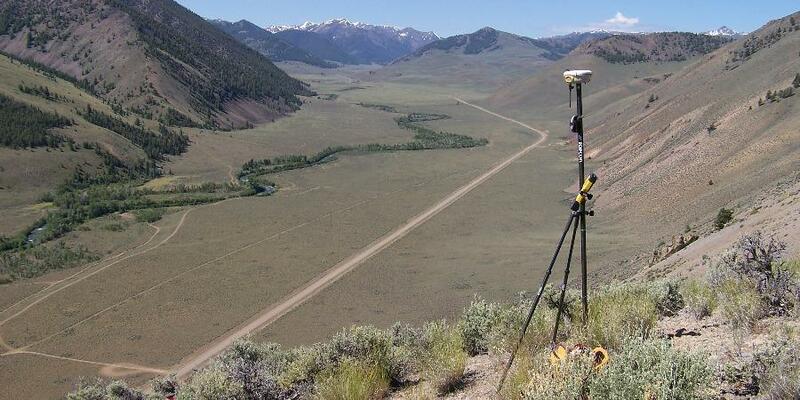 Boundary Surveys are the most typical type of surveying that the average land owner will need, yet often very misunderstood. One might ask, "Why does it cost so much to survey my property?" Or another common comment is, "I have a map showing where my land is, It should only take about an hour to survey my property." A lot goes in to surveying a property. First of all, deeds must be researched that show ownership of the property. Also, research is done to see if there have been any other surveys done in the area that might help in determining the location of the property. Then there are often office calculations done to ease work in the field. Then, we finally arrive at the property and begin the search for the property corners. All the property corners are referenced to common control points, and more times than not, the actual monuments marking the property corners cannot be located. Some are missing because of construction, or simply because they were never set to begin with. Now begins the true search. We must locate corners outside of your property that will help us determine the location of your corners. Some points might be your neighbors corners, while others can be as much as a mile away. Each property and situation is unique. Once we locate the required monuments we can calculate your boundaries and then set or re-set the monuments marking the corners of the property. Then, after all of this, a Record of Survey must be filed at the appropriate county courthouse as per Idaho Code. This record is a map showing all monuments found and set in the field and shows how the property was calculated. This map is very detailed and takes some time to prepare. Also, most of the time new legal descriptions for the property are written and recorded. After the Record of Survey is drafted, it is recorded and copies are sent to the client with the new legal descriptions. This is the average Boundary Survey. As stated earlier, each property is unique and will require different processes to survey and determine the boundary. Most survey companies won't quote a price for a boundary survey over the phone because it is just too difficult to know what it will cost to survey until the property is looked at and some initial research is done. Land Solutions offers free estimates on Boundary Surveys, and will come too your property and help you determine just what exactly needs done. If you need a boundary survey, give us a call. We can help you find your solution! We are highly qualified to provide construction staking for all types of different project needs. We have a combined experience of over 20 years in construction staking, and an excellent track record. We have provided and do provide construction staking for subdivision layouts, roadway alignments, commercial projects, parking lots, buildings, sewer, storm drain systems, irrigation, etc. We can provide topographical mapping for any of your project needs. Topographic data is collected by us using our GPS system or total station and then we draft the data collected using AutoCAD 2006, or if you prefer we provide you with the data in any format so you can draft it. Topographical information can include spot elevations, descriptions, contours, surface data and sub-surface data, cross sections, etc. Land Solutions specializes in providing the client with useful survey and topographical information. We want the client to be able to take our information and start designing with it, not have to go through it and re-invent it. Topographical maps can be set up on layers you specify, whether it be ITD, ACHD, or in house standards. Your standard blocks can also be used in the mapping. So many times we hear of companies that have to take the survey information provided them and go through and change everything to their own working standards because the product provided them from other companies was unclear and not on their layering scheme. Our goal is to have open communication with our clients, and satisfy their needs on an individual basis, not just have one standard that everyone else has to adjust to. We have worked on many major projects in the past to provide topographical mapping and information.